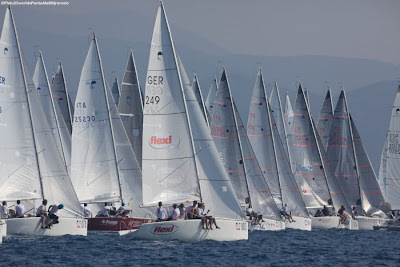 After two days and four races the overall results for the Platu25 Worlds in Punta Ala, the well-known Italian sailing venue, are taking a more definite shape. The 92 boat strong fleet is back on the water to pile up more points and try to qualify for the finals. With a good breeze of around 15 knots, the fast Platu25 boats should then be able to sail up to three races and reach the figure of six, the minimum number needed to compose the Gold and Silver groups. While the Italian and Spanish crew are duelling for the top spots in both the Blue and Yellow qualifying divisions, the rest of the contenders fight back, especially the German teams.? The updated provisional scoreboars show Spaniards from Caiaxanova Men with Marcus Perez leading with a safe margin of 13 points on an Italian couple made of Francesco Vallicelli?s VIS and Sicily based Brera Hotels, helmed by Sandro Montefusco. Kyra, skippered by German sailor Hermann Mueller is tied for fourth place with Jaime Pont?s La Revoltosa from the Real Club Nautico de Valencia. Spanish Olympic medallist Natalia Via Dufresne on Central Lechera Asturiana, is successfully fighting her male competitors and is 8th. As is the other all-female team of Margarita Camaselle, on Caixanova Women representing RCN Vigo, which is 35th. 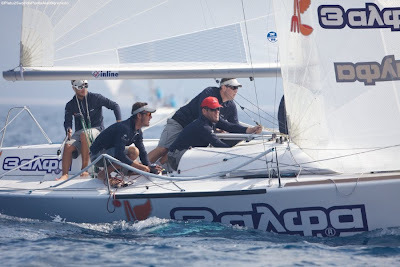 Reigning world champions on Modus Vivendi, skippered by Kostas Karageorgiou from Greece, are striving to recover from a disappointing second day with a BFD they got at the last start and placing them only at the 28th place. 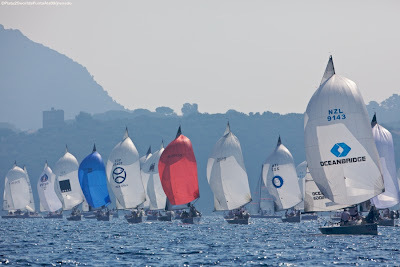 Japanese crews, who came to Italy in good shape to do well are by now half way up the scoreboard with 47th placed Bros owned by Yuki Koike and Noafumi Kamei, and also from down-under is the Kiwi team from Ocean Bridge Sailing, that occupy the 49th position.